There are several medical flea treatments that work wonders at stopping fleas from wreaking havoc on your pup, but that doesn’t mean you can’t try some home remedies for fleas on dogs, too! Fleas on dogs can be a real bummer for you and a health hazard for your dog. If you take your dog to the vet with a skin irritation one of the first questions your vet will ask will be, “what flea treatment do you have your pup on?” Let’s take a look at a few different home remedies for fleas on dogs. Spring means sunshine, warmer temperatures and prime flea season! Photography by Dora Zett / Shutterstock. We’ve talked about how vinegar is a great, pet-friendly cleaning solution, but it’s also a wonderful aid in getting rid of pests. It turns out that fleas don’t like the smell of vinegar and you can use that to your advantage. A clean spray bottle, one that hasn’t had any chemical cleaning products in it. White vinegar and apple cider vinegar (ACV) both work. Pick your favorite, whatever is in your cupboard already or what’s on sale. Mix water and vinegar together. The most effective solution is a 1:1 ratio. If your dog finds that smell offensive, you can dilute as much as 1:3, vinegar to water. Spray your dog, making sure to avoid his eyes and any open sores. Let your dog’s fur air dry. Repeat this at-home flea treatment for a couple of days. If your dog doesn’t like the spray bottle, soak a washcloth in the mixture and wipe your pup down with it. Apple cider vinegar added to your dog’s water bowl can give your dog’s skin an acidy taste that will make him less attractive to fleas. A good rule of thumb is to mix a teaspoon of ACV for every quart of water. It’s best to consult your vet to see what amount of vinegar a dog of your pup’s weight can safely ingest. Your pup may turn up his nose at this new liquid mix. If so, start with just a tiny amount of ACV and increase the strength as your dog gets used to the smell and taste. Diatomaceous Earth – Food-grade diatomaceous earth is a natural and safe product made from the fossilized remains of tiny organisms. The silica that make up these organisms absorbs into insects with an exoskeleton, like fleas, and causes them to dry out and die. When you use it outside, just liberally sprinkle it everywhere you think fleas may be hiding out. Sun – Fleas, much like their blood-sucking vampire relatives, don’t love the sun. Keep your garden as shade free as possible. Plant an herb garden – Planting strong-smelling herbs near your doors and windows can help prevent fleas from hanging around too long. Try thyme, sage, clove, basil, lavender or mint. Natural predators – Snakes, ants, beetles, spiders, frogs and lizards eat fleas. In fact, you can add natural predators to your yard! Nematodes are multicellular animals that are deadly to flea pupae and larval. You can purchase them online or at a local garden store. Your secret weapon to keep your dog’s bedding, linens, clothes and toys flea free is heat. Anything that can be safely washed in hot water and dried on high heat, should be weekly. Fleas won’t survive the double attack of heat. Lemon – Cut up a lemon and steep it in water overnight. Add it to a spray bottle and you have a pleasant-smelling homemade flea repellant that can safely be used near your pup’s favorite spots or even on him. Salt – Clean hardwood floors and tile floors around your dog’s bed with a salt/water mix. Essential Oils – Rosemary, tea tree and lavender don’t smell good to fleas. You can use them to help keep your living space smelling nice — and staying flea free. But use essential oils with caution. Some essential oils are harmful to pets. Talk to a vet to ensure that the scent and the way you are using the oil are safe for your dog. Hopefully you’ll only need preventive home remedies for fleas on dogs this season. Tell us: What do you use at home to keep fleas at bay? What are your tried-and-true home remedies for fleas on dogs? Let us know in the comments below. Thumbnail: Photography by Christian Mueller / Shutterstock. 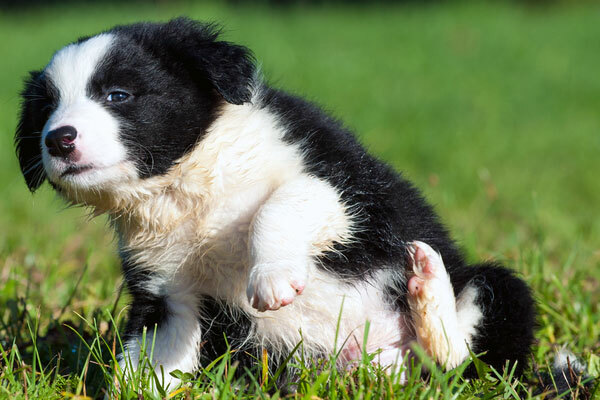 The post 5 Home Remedies for Fleas on Dogs appeared first on Dogster.